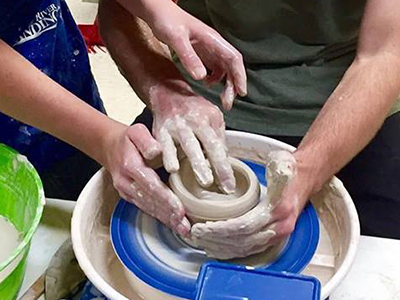 Explore throwing pots on the pottery wheel, hand-building techniques and the glazing process to create fun and functional pieces. Open to students of all skill levels. Studio fee includes clay, tools, use of pottery wheel, instruction, glazes and firing. *Recommended for ages 16 and up. NEW punch cards available for six sessions. I, the undersigned, hereby grant permission to The Art Museum of Eastern Idaho and its assigns the right to reproduce, publish, exhibit, or distribute photographs of the student. It is understood that the student's name may be printed with his/her photo. It is further understood that these rights extend only to educational and non-profit uses, and that further permission will be required for commercial uses for profit. If we cancel a class for any reason, we will notify you immediately and you will receive a full refund. If you withdraw from a class three weeks prior to the starting date of the class, we refund your tuition less a 10% processing fee. No refunds will be made on withdrawals within three weeks of the starting date. Copyright © The Art Museum 2019.